Description: CSXT Southbound Intermodal Train at Homeland, Ga. 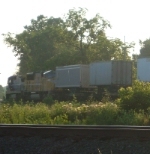 Description: This UPS train takes the transfer track in Greenwich and heads toward Willard on a Wednesday evening. Description: UPS train headed west onto the B&O on a hazy, humid summer evening. Description: CSX C40-8 7545 leaves the DeWitt intermodal facility with a stack train, as sister 7608 backs down onto a string of cars. Description: Switch engine power at Oglethorpe lays over on a sunny weekend. Description: Daily train from Waycross, Ga to Taft Yard (Orlando, Fl). Description: CSX 8068 will lead F757 or Y250 and the CSX 7608 will lead a rock train to Savannah holding the main track. Description: CSX 7608 is at Augusta yard. Description: horrible shot of two trains racing. its really 3 trains at once a south shore local is behind me. Description: The westbound N650 wih CSXT 7608 & CSXT 7387 in Run 8 while seen passing in front of Kan. Co. Emer. Amb. Auth. Station 31 on number two main. Description: Yes another on the BNSF lines. Description: Having come off the Indy line at Sidney, Q227-05 passes over US 36 on the east side of the city on the Toledo Sub. Description: A CSX track crew pulls a downed tree out of the way so that this engine can plow a path through snow on tracks that have not been used in quite some time. Train traffic was just restored to this line yesterday. CSX 7608 was having a train put together behind it, back in the CSX yard. We now have about more than 2 feet of snow on the ground.